The victim was a regular in Hate Camp, founded twenty years ago by Hate Man, a former New York Times front page reporter. 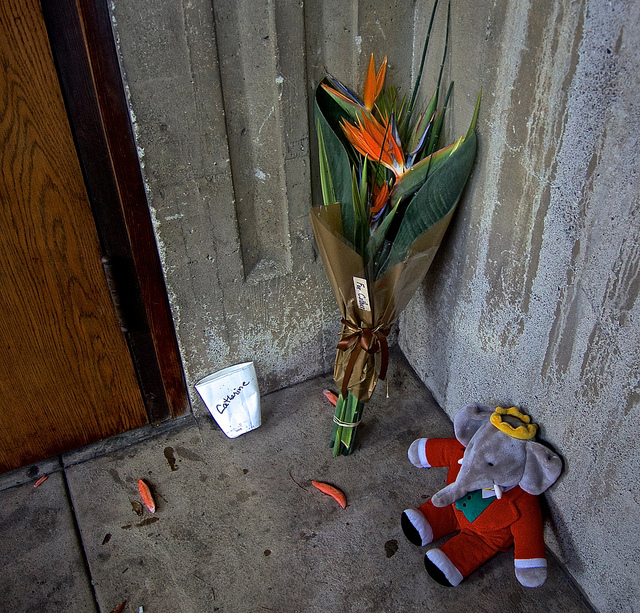 An ersatz memorial (pictured) included a styrofoam coffee cup (inscribed with Magee’s first name, by Hate Man). Barbar, the bear, a stuffed toy, and a faux bouquet made by a close friend. Barbar was to have been a gift from a close park friend. Her last meal may have been minestrone soup from a food drop, according to a homeless man of whom she asked a light the night she died. Catherine Magee was, reportedly, in good spirits before her death. She had a ticket to Reno for March 1, where she looked forward to visiting family members. She had a daughter and seven grandchildren, according to one of her friends in People’s Park. Her husband of 26 years died ten years ago. She recently mourned him in the park on their anniversary. “She really loved that guy,” said a friend. “I got the idea she came to the park ten months ago to die,” said the friend. She was 63. “She’d been clinically dead, she was told by ER nurses,” the friend continued. A park regular claims to have teleported to her ER room, where he saved her from death. But no one could save her the night she died. She had been hospitalized five times from People’s Park, with pneumonia, hypothermia, and asthma. She is thought to have had pulmonary obstruction. Her last jobs were in smoky San Pablo bars and at a donut shop there. It would not be implausible to conclude that her health problems, chronic smoking and, allegedly, in the park–drug and alcohol use may have killed her. Views here do not reflect those of publications in which my work appears. This entry was posted on Friday, February 28th, 2014 at 6:46 am	and is filed under People's Park, Telegraph Avenue, The Berkeley Scene. You can follow any responses to this entry through the RSS 2.0 feed. You can leave a response, or trackback from your own site.